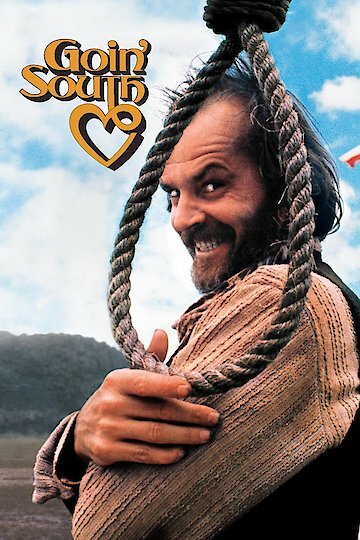 "If ya wanna get saved, ya gotta get hitched"
Goin South is a western comedy that stars Jack Nicholson and Mary Steenburgen. The 1978 American classic has a all-star cast, the film other actors are Christopher Lloyd, John Belushi, Richard Bradford, Veronica Cartwright, Danny DeVito, and Ed Begley Jr. Henry Lloyd Moon is a career criminal that is has finally been captured and sentenced in Longhorn, Texas. He was allowed to walk free due to a city ordinance that allowed a single woman to married him and take responsibility for his actions. In addition to taking responsibility for Moon's behavior, Julia married Moon because she wanted him to work a gold mine that is on her property. After marrying Moon, Julia is introduced alcoholic beverages and Moon's old gang, Moon's gang learns about the mine something he wanted to keep a secret. True to his character, Moon plans to steals his wife gold, but has a change of heart. Goin' South is currently available to watch and stream, download, buy on demand at Amazon Prime, Starz, Amazon, Vudu, Google Play, iTunes, YouTube VOD online.